Josh Dossett grew up in San Antonio, where he began art classes as a child with Jacqui Von Honts. He sold his first lithographs, as a ten year old, at the Riverwalk's "Starving Artist Show". He went on to earn a BFA from Texas Tech University where he focused on glass blowing with Bill Bagley and ceramics with Vern Funk. 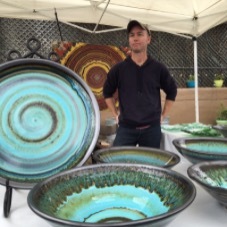 Josh then worked at Armadillo Clay and Supply in Austin Texas where he began to concentrate his efforts on pottery. Selling on South Congress since 2003 he developed unique glazing techniques with earthenware, lead free, dinnerware safe glazes. Josh's works make great gifts!